Christmas, crafting, enjoying the moment. We had our Christmas dinner on a lovely piece of fabric that I had not hemmed -it still looked lovely. I did manage to enjoy all the decorations without my bunting, heart felt garlands, handmade stocking, etc etc. So… note to self, (when the magazines and shops are revving up their ‘best ever Christmas’) it doesn’t matter! What matters is having fun with your nearest and dearest without throwing a wobbly over the handmade thingamy that is supposed to be the pinnacle of the celebrations but you feel you have to finish like a sweat shop sewing machinist on Christmas Eve. Everyone just wants a glass of wine and play a game or two! (Luckily I ditched all the ideas of the handmade thingamys way before Christmas eve and was happily playing a word game with my beloved over a glass or two snug as a bug). My resolve was further enhanced by creating my body double for my dressmaking… oh la la.. all those curvy bits that have become even curvier! Yoga is proving to be absolute bliss.. 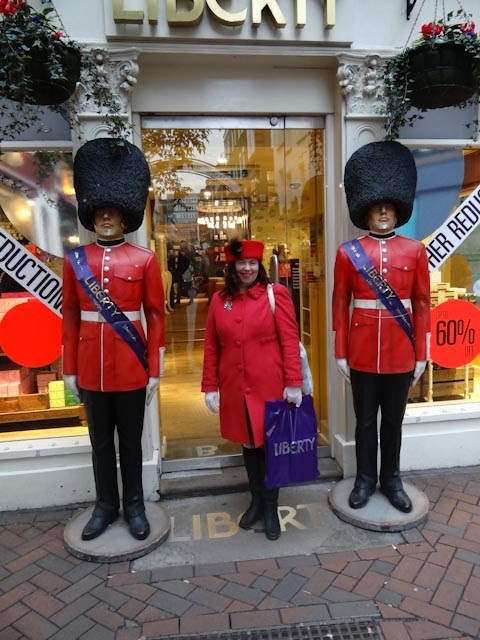 I had a fabulous birthday, whisked off to a famous London store to spend a little credit card! Needless to say it was well and truly swiped clean of the credit in under half an hour in the fabric department! See photo above and try and guess which store… (I am the one in the middle) the shop is famous for bodices, fabric, (did I mention fabric?) the arts and crafts movement. Oh.. the shop itself is absolute bliss, little fireplaces tucked away with exquisite tiles! It looks like a tudor building but really isn’t that old… Of course delightful Mr D, did recognise that I do have certain endearing qualities. The way I strolled through the jewellery department without a second glance, my eyes fixed on another one of my passions… stationery. Notebook (with cream pages) the latest edition to my growing collection. 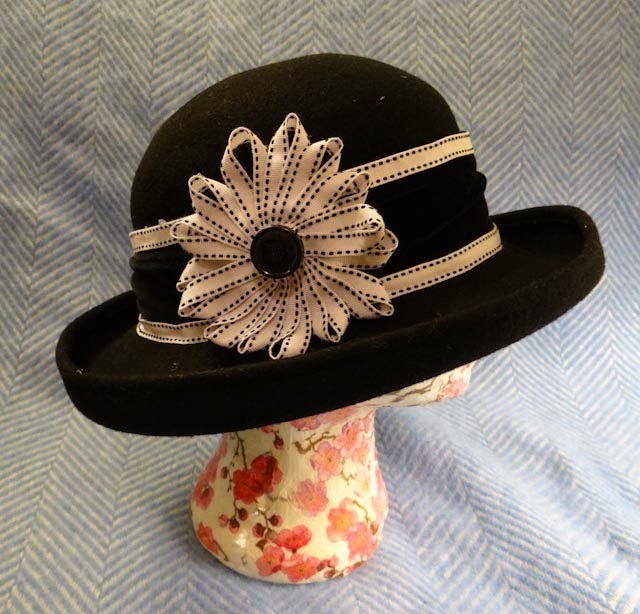 Not only am I a fan of hats, but I admit to feeling somewhat envious of the glorious hats worn in Downton Abbey. 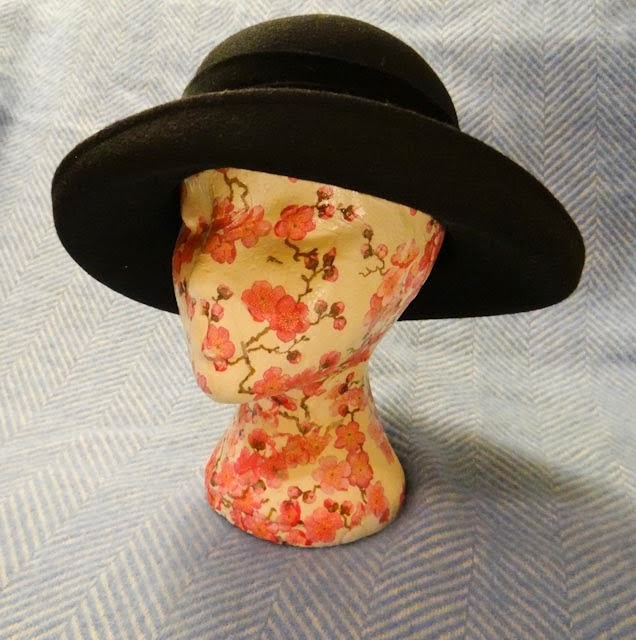 With the winter upon us, I found this little wonder hiding on a very high self in an vintage shop, it was the perfect shape for a project I had in mind, but it was a little plain. 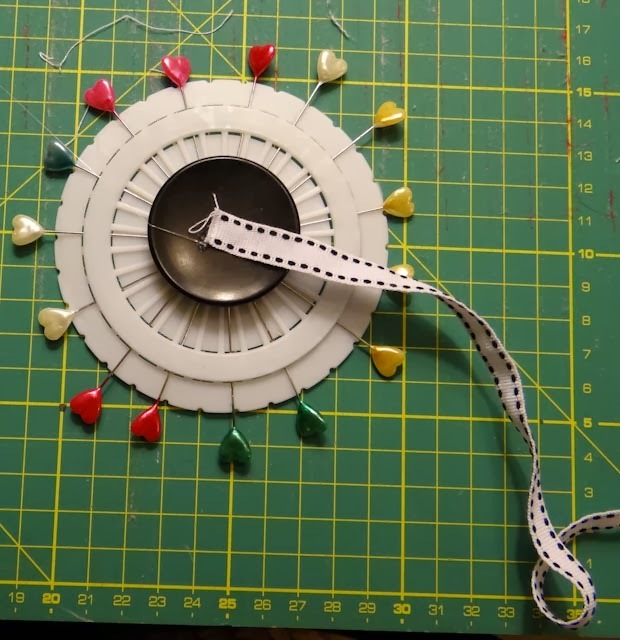 You can purchase pins in these beautiful little plastic holders, but they make brilliant templates to make ribbon flowers. 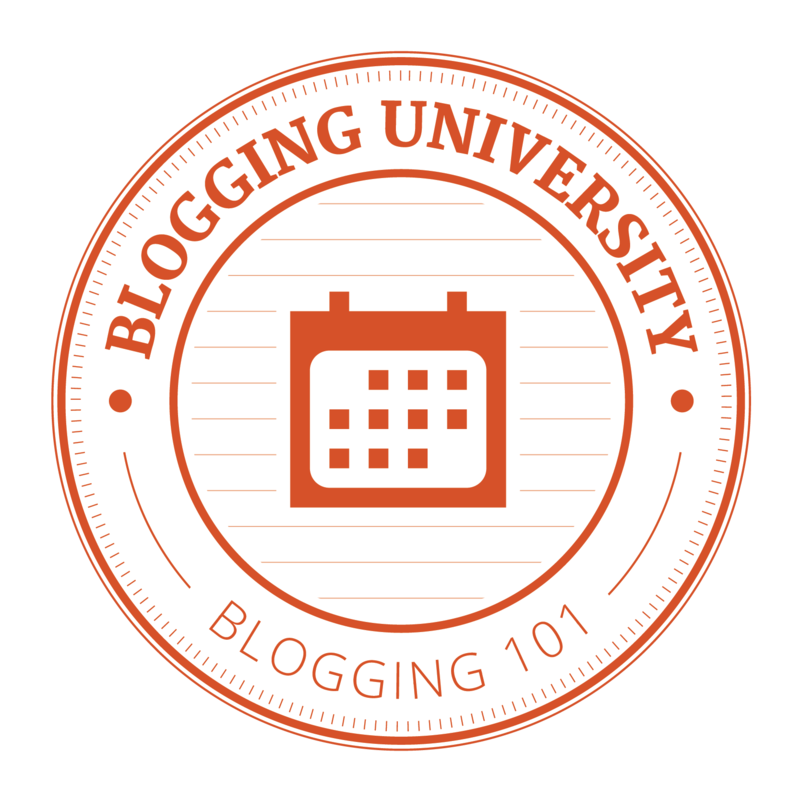 You simply decide on your spacing, I usually decide this by the width of ribbon I am using. 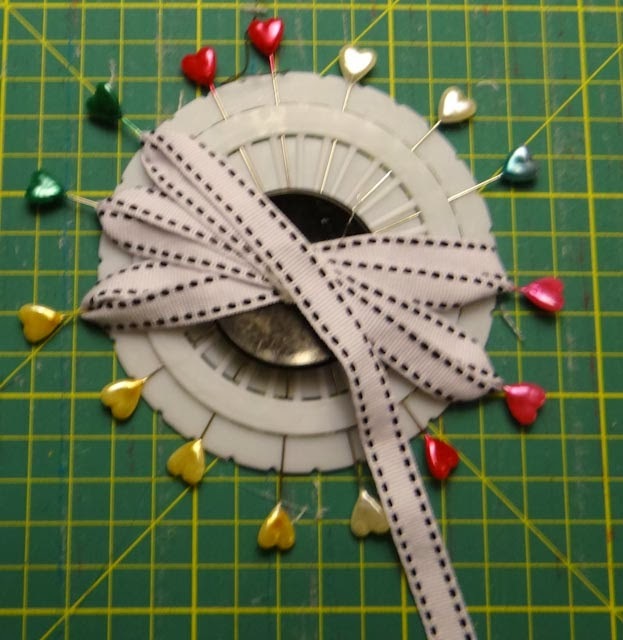 Attach the end of your ribbon with a hot glue gun to a large button placed at the centre of your circle of pins. Press lightly and hold until the glue has cooled slightly. 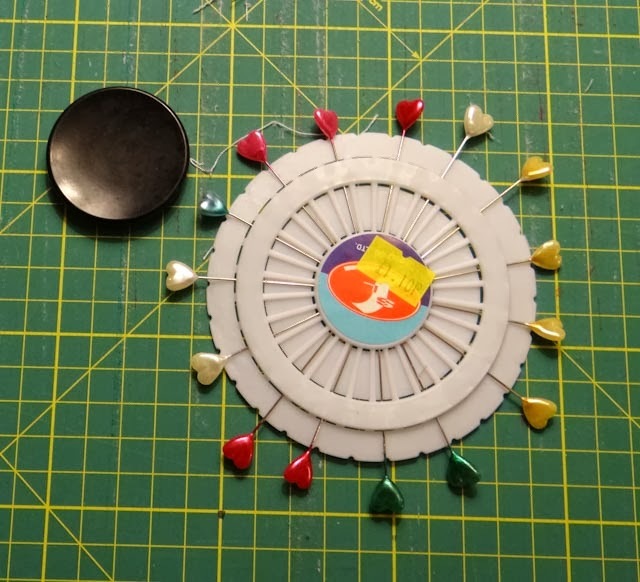 Wrap the ribbon around the pin and then glue as it crosses the centre, directly over the spot where you started. 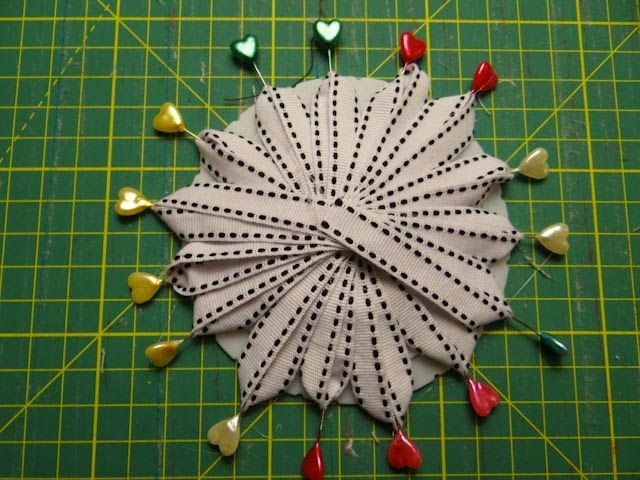 Continue wrapping the ribbon round the pins, and fixing the ribbon in the centre, until you have completed the circle. 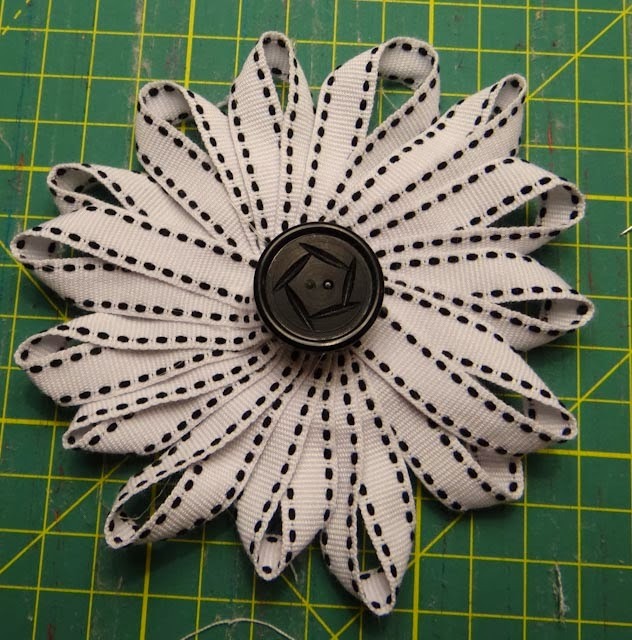 Glue another decorative button over the centre of the flower and remove the pins. You will be able to remove the flower from your pin circle. 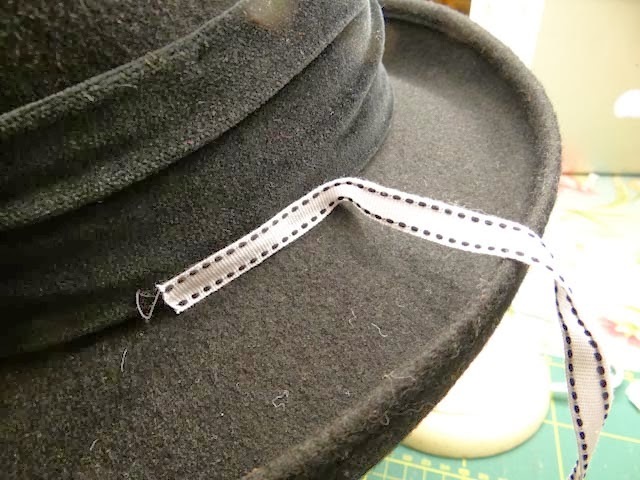 Decide where you wish to glue the ribbon around the hat, and working slowly glue every few centre metres along the edge. Press down lightly and wait for the glue to cool before moving on to the next spot. Glue the ribbon in place and there you have it! 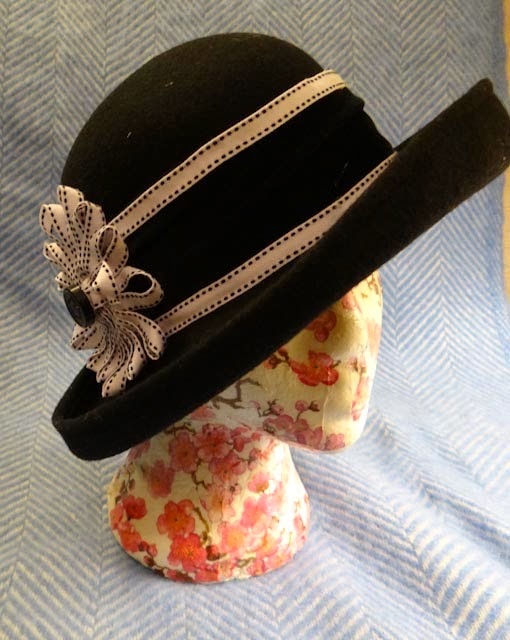 A gorgeous hat with ribbon trim, all you need now are the army of servants to carry your shopping!